1. Preheat oven to 350 degrees. Coat a regular (12-cup) muffin pan with cooking spray. Since this recipe makes 9 meatloaf muffins, you’ll only fill 9 not 12. Set aside. 2. To make bread crumbs: Toast 1 slice whole wheat or multi-grain bread. Place in blender and pulse until made into crumbs. 3. In a large bowl, add ground turkey, bread crumbs, onions, egg, Worcestershire sauce, ½ cup barbecue sauce, salt and pepper. Using your hands or a large spoon, thoroughly mix together until well blended. 4. Add meatloaf mixture to the 9 muffin cups, flattening out the tops. 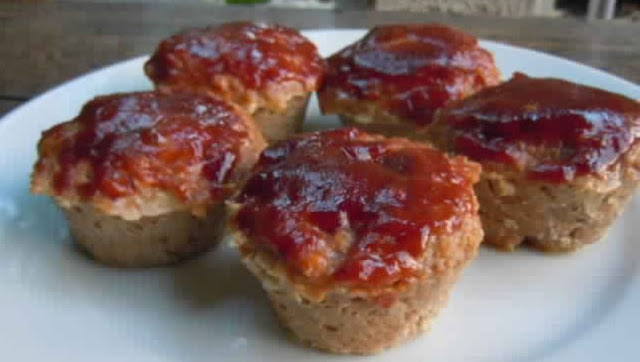 Top each meatloaf muffin with ¾ tablespoon barbecue sauce and spread evenly over top. 5. Bake for 40 minutes. Run a knife around each muffin to loosen it from pan. Remove to a serving plate. I love Milton’s Multi-Grain bread and used it to make the bread crumbs. It’s sold in most supermarkets and Trader Joe’s. Sweet Baby Rays is such a delicious barbecue sauce. You’ll find it in most supermarkets where other barbecue sauces are sold.